New version CDI with smoother transit advance curve and improved soft anti vibration gel for better protection. Fits looms with 5 PIN A/C Chinese connectors. The unit is supplied with a pair or white wires coming out of the unit. Connect these to engage the rev limiter. Leave the wires unconnected to allow free revving. Choice of switch to engage or disengage rev on demand. Some performance engines will go into valve bounce at around 12000 RPM during shifting up the gears. This may cause a major flat spot in the start of the next gear rev range due to turbulence in the intake from the valve bounce, so if we set the rev limiter to cut in 200 rpm before the bounce you can avoid this. 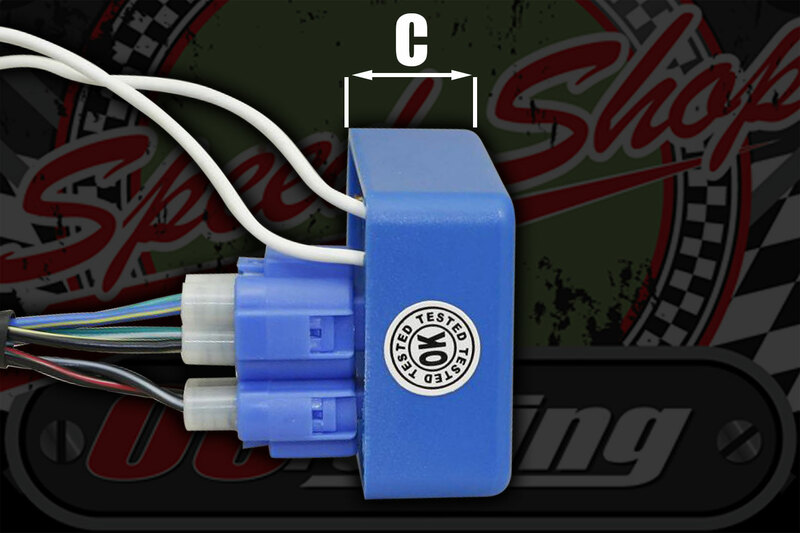 It eliminates any turbulence in the intake avoiding a flat spot when you get back on the gas. No more burbling back out through the carb! Unlike a lot of standard or performance CDI's; This will keep the advance down for starting making the engine far less susceptible to kick back during starting. Advance and static is relevant to pulse coil gap and size of trigger. THE CDI REQUIRES RUBBER MOUNTING TO ENSURE LONGEVITY.THESE RUBBER STRIPS ARE IDEAL. ALTERNATIVELY WE HAVEHIGH DENSITY FOAM PADS THAT MAY SUIT YOUR NEEDS.